Happy Your Best Weekly Everyone!!! I have been waiting ever so patiently to share this with you all. 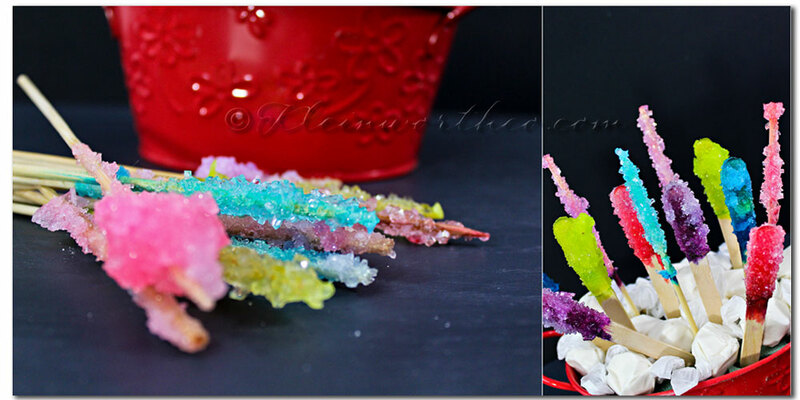 I figured back around Easter time that I would make rock candy with the kids. Only thing is- you have to be very patient because it takes a while. Then I wanted to make more than one batch- so yet again, the waiting. So anyhow- they are finally done growing (for now- I will probably make more again soon) so I can show you these & you can hopefully make some with your kids or for a party or gathering you have coming up. Start adding sugar- 1/4 cup at a time. Stir in sugar until it no longer dissolves. The more you add the longer it will take to dissolve. Be patient & try to get as much as you can in there. Take your skewer & dip it in the sugar liquid & then roll in granulated sugar to coat. Stick in plastic cup & attach a clothespin to it to keep it suspended in the middle of the cup. Remove your liquid from heat & allow to cool completely. This is very important. Fill your cups with the liquid- with this recipe you should get about 2 plastic cups worth. Add your food color- & stir. Put in more than you think you might need- if you want the colors vibrant. I also used the Neon shades of food color for mine instead of the standard colors. Set somewhere where they can be left alone for a week. Wait patiently. It will take about 3 days for small crystals to form & about 7 days to get them large enough to enjoy. You will notice that the liquid will crystallize on the top& bottom of cup too. You should be able to watch the process as they grow. When you are ready to remove- gently break the top layer. Remove skewer & leave hanging into another cup until dry. Once dry they are ready to eat. These are super simple- just take a bit of patience. How cool! 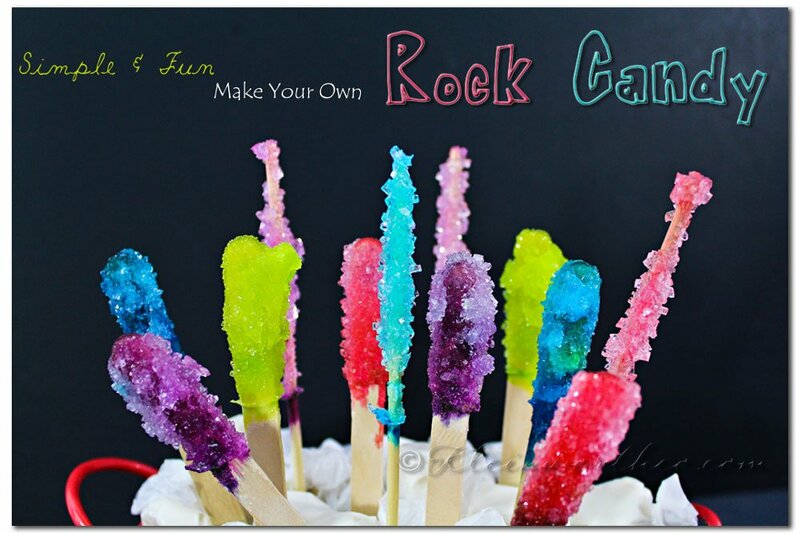 We love rock candy so this would be lots of fun! Oh My Gosh, these are so cool looking. 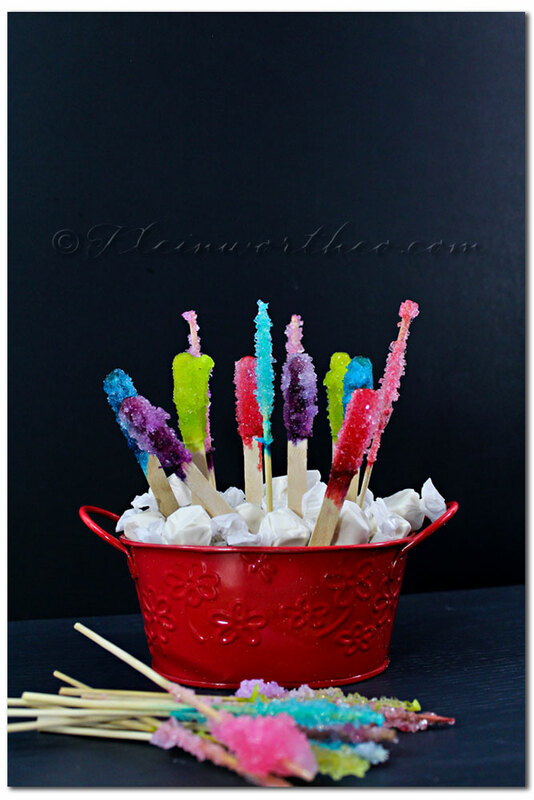 I have not had rock candy since I was a kid and that was a long time ago! What a great treat for your kids. 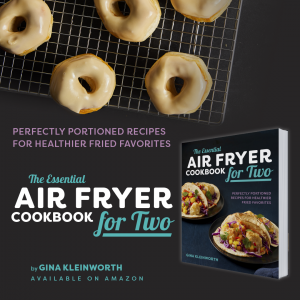 Thank you for linking this great recipe and memory to the In and Out of the Kitchen link party. I can’t wait to see what you bring next week. 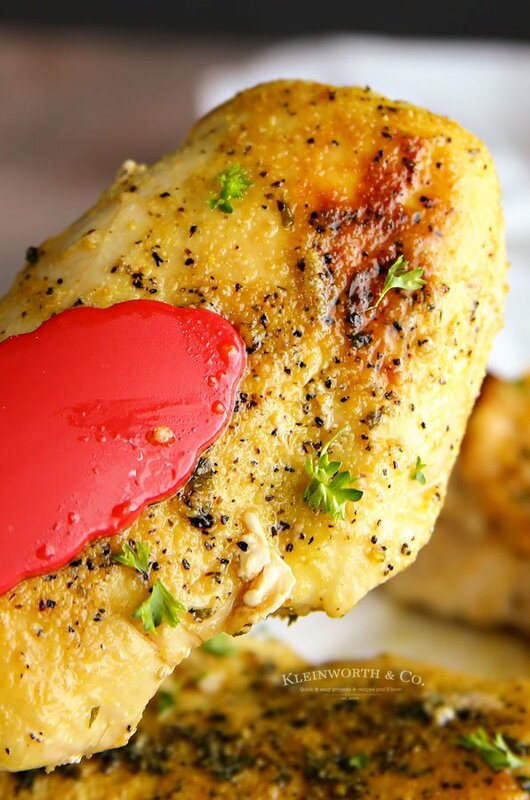 I am pinning this fun recipe! Gina, it turned out great! You have a lot of patience….not a project for me. Have a great night. These must have been fun to photograph! So many beautiful and bright colors! They look yummy! what a fun project! I love how it came out! so colorful! Wow. Amazing. 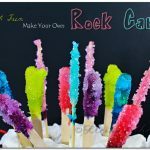 My kids may want to give this a try – they love rock candy! I love how colorful these are! What a fun idea, but you always have fun ideas! I’m looking forward to getting through these next few weeks, so I can start making stuff again. I need summer! Love this idea! I’d love for you to come link this up at The Weekly Creative- a party I co-host with The Girl Creative! My kids used to love getting these when they were younger. They were a special treat. I will have to give these a try!